Once you have registered you will be sent a password by email (you must of course enter a valid e-mail address in order to receive your password). 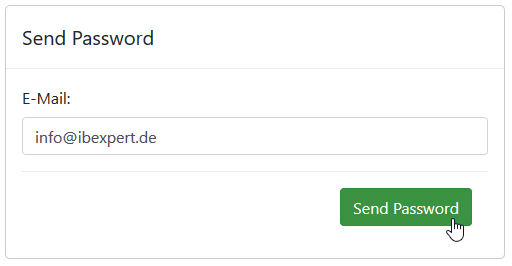 You will be sent an 8-digit password by email, with the subject heading Your Password for the IBExpert Downloadcenter, immediately following registration. After clicking the Change button, you can alter any or all information with the exception of your email address. Here you can view all available software that has been purchased for this email account, as well as the free IBExpert Personal Edition. Information includes the number of remaining available activations as well as the subscription expiry date. Important: without a valid subscription you wil no longer be able to access any new versions uploaded here. Click on the IBExpert version you wish to download and save. If you cannot see your IBExpert software here, your IBExpert software subscription may have expired. You can purchase the relevant software edition online. By downloading and installing the free IBExpert Personal Edition, you are agreeing to the contract terms, as stated on the free IBExpert Personal Edition product page. If your anti-virus software claims to have found a virus, please ignore. As it says in the Downloadcenter: All files are digitally signed and virus tested on www.virustotal.com with more than 40 antivir products. Here you can view all current software activations detailing the computer name, machine code and timestamp of the activation. Should you have an IBExpert Hotline account, you can also view the details here. You can download all IBExpert versions (IBExpert Customer Version (IBExpert Developer Studio Edition), IBExpert Day Edition, IBExpert Developer Studio Company Year Edition, Free and Full IBExpert Educational Editions, free IBExpert Personal Edition, and the IBExpert Server Tools etc.) from the IBExpert Downloadcenter. If you haven't yet created an account in the IBExpert Downloadcenter, please first read: Registering your IBExpert software. Download your IBExpert version, as described above. Please ensure you always use the most current IBExpert setup.exe. Following confirmation of the Software Agreement and confirmation or alteration of the installation directory, IBExpert is automatically installed and started. 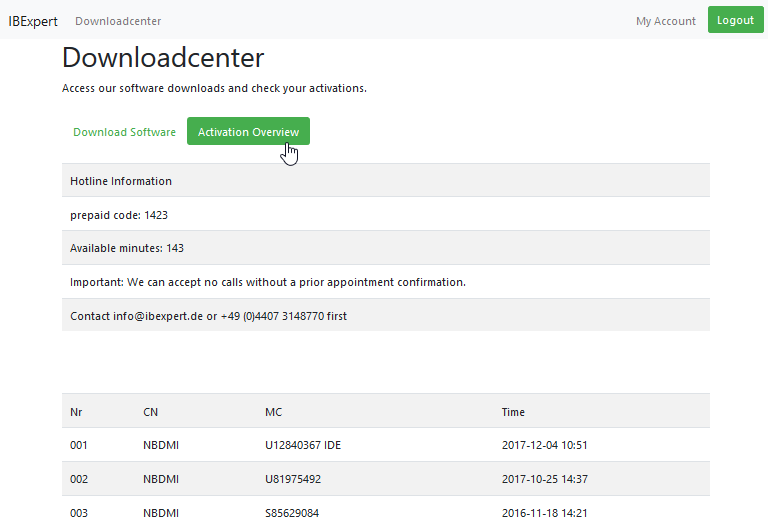 When installing your first IBExpert customer version you will be asked to register the product the first time the application is started. This is described in detail in the next section, Registering your IBExpert software. 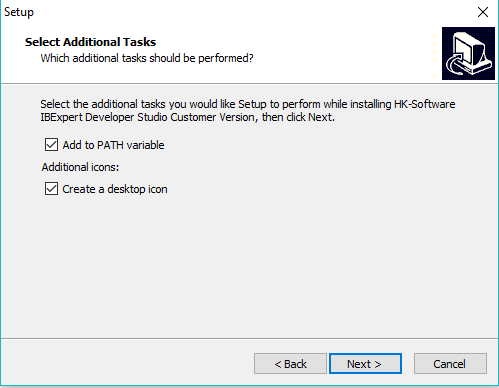 To alter the IBExpert interface language, use the IBExpert menu Options / Environment Options. Use the drop-down list found under Interface Language to select the language of your choice. This dialog also offers default options for the specification of the database version and client library. It is also important that you set up your IBExpert User Database before starting work with IBExpert. To keep you informed of all new developments, we recommend you retain IBExpert Direct which is automatically activated in IBExpert. Further information regarding IBExpert Direct and adjusting the default settings can be found in the IBExpert Help menu item, IBExpert Direct. We also recommend you subscribe to the IBExpert newsletter, which informs you of new developments and new versions (including documentation of all new features). 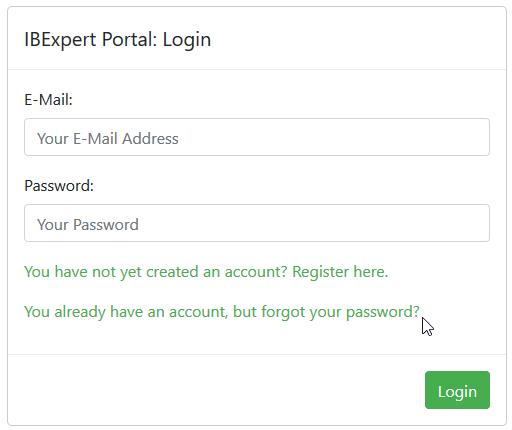 Log into your IBExpert Download Center account, click My Account (top right) then Change and activate the I would like to receive the IBExpert newsletter checkbox to subscribe. Alternatively follow us on Facebook or Twitter. To help you get started in IBExpert and Firebird, we offer a comprehensive online documentation. And you will find a range of tutorial videos in our Learning Center or on our YouTube channel. Or you can take advantage of our range of support offers. Should you encounter any problems whilst attempting to download and install IBExpert, please send an e-mail to register@ibexpert.biz, with a detailed error description (including screen shots).